Pair of 606 Barrel Taliesin chairs Frank Lloyd Wright for Cassina... 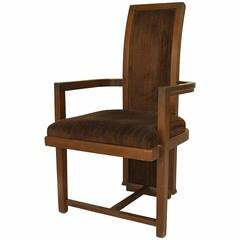 Retains original dark Lacquer finish as well as arts and crafts style upholstered seats. Cassina impressed mark. Without question the greatest architect the United States has ever produced, Frank Lloyd Wright and his philosophy of “organic architecture” — of buildings that exist in harmony with their natural surroundings — had a profound influence on the shape of modern life. Wright gave us some of the most elegant and iconic structures in America: residences such as “Fallingwater,” in rural Pennsylvania, the Robie House in Chicago, and “Taliesin,” Wright’s own home; and masterful institutional structures that include the Unity Temple in Oak Park, Illinois, the Johnson Wax headquarters in Racine, Wisconsin, and the Guggenheim Museum in New York. Whenever possible, Wright designed the furniture for his projects, to ensure an affinity between a building’s exterior and interior. Wright’s wooden chairs and tables for his “Prairie Houses” of the early 1900s have sleek, attenuated forms, influenced by both the simplicity of traditional Japanese design and the work of Gustav Stickley and other designers of the Arts and Crafts movement. For Taliesin and several residential projects, Wright designed severely geometric chairs that are marvels of reductivist design. He revisited many of these forms in the 1950s in furniture licensed to the firm Henredon, adding a decorative frieze-like element to the edges of tables and stools. The works on these pages also show how happily Wright embraced new forms and materials. His desks and chairs for Johnson Wax have a streamlined look and use tubular steel to the same effect as designer Warren McArthur, who collaborated with Wright in the interiors of the Arizona Biltmore Hotel. 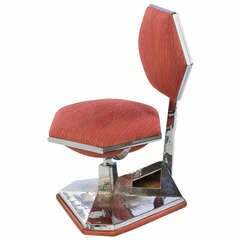 For the Price Tower (1956) in Oklahoma, Wright designed angular wooden desks as well as upholstered pedestal chairs made of chromed steel — audacious furniture for his tallest completed building project. The beauty of Frank Lloyd Wright’s furniture designs is that while many of us wish we could live in one of houses, his chairs, tables, and sofas connect us directly to his architecture, and to the history he made. Stunning Pair of Contemporary Modern Birch Arm Chairs, Bernhardt Furniture Co.
Set of 12 dining chairs comprising two arms and ten sides. 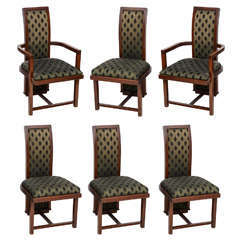 Set of 12 dining chairs comprising four arms and eight sides. 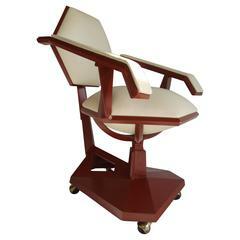 Designed by Frank Lloyd Wright for Henredon, a 1940s American stained mahogany armchair with a "T" form stretcher and a brown velvet upholstered seat and back. A large 'Willets House, circa 1901' style oak armchair, with 16 thin vertical slats. New fine leather seat. Appears to be refinished. Three available.